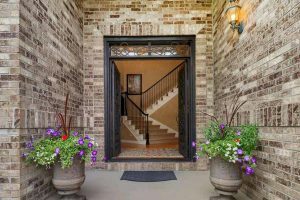 A grand double steel door entrance invites you in to a perfectly maintained, cul-de-sac home in the coveted City of Castle Pines, CO. Backing to open space with mountain and city views, this 5,000 square foot home features 6 bedrooms, 5 bathrooms, oversized 3 car garage, open floor plan where you can indulge in your culinary skills while enjoying backyard views and watching Sunday night football in the adjacent vaulted family room. The perfect family friendly layout includes 2nd floor bedrooms, en-suite bathrooms and plantation shutters throughout. The fully finished basement offers a retreat for all complete with guest suite, exercise or craft room, gaming area and living area perfect for movie nights. As if that’s not enough, the backyard is a true oasis. Calling all Basketball lovers, this is the home for you! 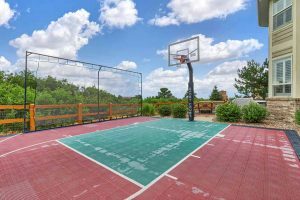 1/2 Sport Court, beautifully maintained lawn fully fenced for pets, brand new hot tub and million dollar views! Welcome to your Colorado Dream Home! You can find detailed MLS info on this gorgeous home here.